Another Friday Mashup Challenge post. This week, the FM174 challenge was to create a project using the Bokeh technique, or to create a project using die cuts, or to mashup both challenges and create a project that incorporates Bokeh and die cuts. I used a piece of Cotman 140lb water colour paper cut to 5½ x 4¼” for the background that I eventually cut down to about 5 x 3¾” to use on the card. The Cotman water colour paper isn’t a bright white but when the whole surface is painted you’d never know. The paper I use comes in spiral bound pads and stands up well to being heated with my heat tool when drying and for embossing. I followed the tutorial video pretty closely for the watercolour background. Once the paint was dry, I used two difference size circle punches, and a small star punch to create stencils. Using a makeup sponge and my stencils I inked on Brilliance Archival Ink in Platinum Planet to finish the Bokeh technique. If I were going to repeat the technique, next time I would use smaller circles for the inking part. At this point in the project I was so excited about getting my background done that I forgot about the second part of the mashup–Die cuts– and just continued on my merry way…I was in the zone. Using the same circle punches I used for making my stencils, I punched two circles in the background. 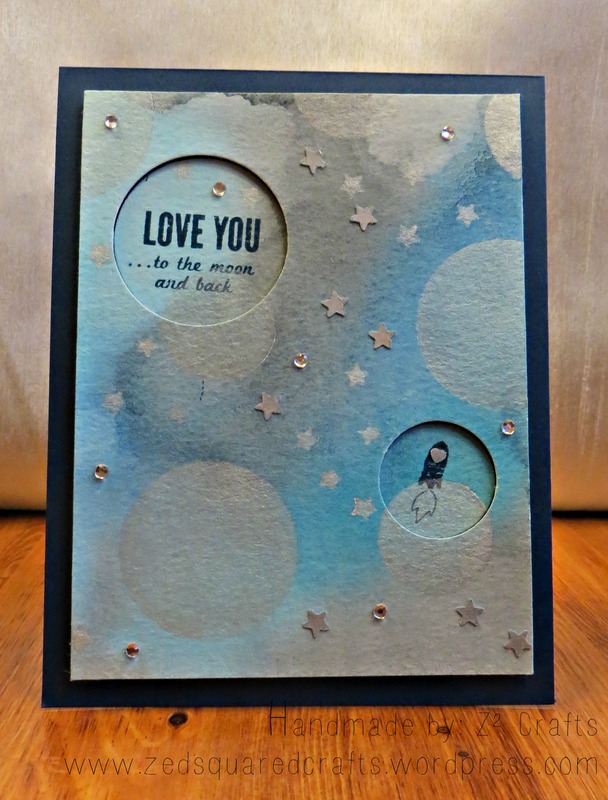 With a Post-it tape mask, I stamped the Love you to the Moon for the sentiment and spaceship (I wanted to use different parts of the same stamp) with Not Quite Navy classic ink onto the circles. Just to add a little more shine and sparkle, I smooshed silver ink onto a strip of scrap paper and clear embossed it to punch out some silver stars and adhered them to the card using Tombow Mono liquid glue. I also added some small clear rhinestones for good measure. To assemble the card, I mounted the background to my navy A2 cardbase using foam tape and then popped the circles back into place directly on the card using my tape runner. I’m looking forward to experimenting more with the Bokeh technique. Trying something new each week is one of the reasons I enjoy the Friday Mashup challenges. Thanks for dropping by! I have recently been obsessed with using strips of patterned paper to make busy striped backgrounds. Around the house, I call these “stripped” backgrounds. b) They are narrow enough that you get stripes instead of bands. I’ve been using patterns from various 6 x 6 paper books and selecting four or five pieces that complement each other, or the theme of the card. I cut two or three strips from each piece, depending on the size of the card. Next, I start from the middle by laying the first strip over the card base on as much of an angle as is possible so that both ends go off the edge of the card. I tend to start in one corner and rotate until the strip covers to the other end. Once the middle strip is placed, I lay out the whole card to make sure the strips will reach the edges. Laying out my strips I start from the centre. Once everything is laid out, I adhere the centre strip using my tape runner on the back of the strip. Then I repeat until the whole card is covered. The last step to finish the background it to trim the sides. 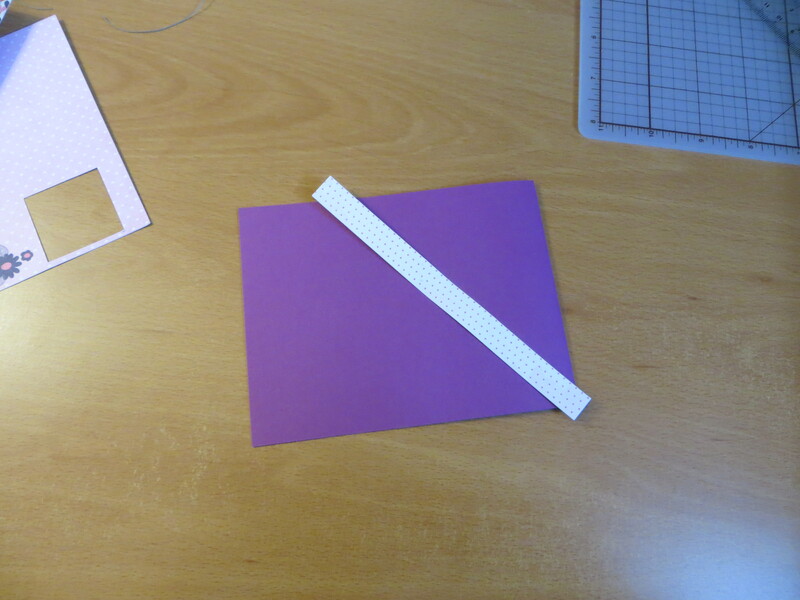 To do this, I turn the card over and use scissors to trim the strips around the card. I do on occasion use my trimmer. One final note is to suggest that you check the edges of the card. I find that I sometimes need to add a little extra adhesive if the edges are lifting after I’ve trimmed. To do this, I just use my Zig 2 Way Glue Pen.